Why are my emails going into recipients spam folders? You may have found yourself often fighting the issues of having your business emails getting marked as spam in your customer’s inbox. If the emails are marked as spam, your business emails will fail to reach your customer's inbox. There are many reasons for emails marked as spam. In this article, it will be discussed about some important terms to be known and steps to stop emails being marked as spam. The spam box is for storing unwanted emails or spam emails. Spam box is created by mail servers as well as by user’s email program or client. The emails that are caught in the spam filter are marked as spam and moved to the spam box. The spam filter determines emails as spam by checking the spam score. The spam score ranges from 0-10 and it is highly recommended to get a score below 5 to allow emails to recipient’s inbox. The lower the spam score, the higher the probability for the emails to end up in the inbox rather than marked as spam. Apache SpamAssassin is a very popular open source email filter that examines incoming email and tests for spam characteristics. It uses Bayesian spam filtering and network tests to screen incoming email. The scores can be positive or negative. The higher the positive score is in your email, the higher the probability that the message is spam. This results in an overall score that Apache SpamAssassin uses to determine whether it should discard a message. You can enable SpamAssassin on your cPanel server by following the below steps. Email spoofing is the creation of email with a forged sender address. When the emails are spoofed, it appears to have originated from someone or somewhere other than the actual source. Email spoofing is a method commonly used by spammers to send bulk emails/spams. SPF =>Sender Policy Framework is a DNS text(TXT) entry which shows a list of servers that are allowed to send mail for a specific domain. It is used as an email authentication method that allows emails to be sent only from an authorized source. DKIM =>DomainKeys Identified Mail is also an email authentication method to verify that the emails are trustworthy. It ensures that the email contents weren’t changed from the moment it left the initial mail server. Did you know that in your email hosting you can also test your PHP email functionality with the help of standard SMTP or with the help of SMTP with SSL certificate. And today if you want to test your PHP email functionality then we would recommend you to use SMTP with the help of the authentication. 1) Check whether your domain is blacklisted. You can check the blacklists by visiting http://www.mxtoolbox.com/blacklists.aspx. Enter your domain name or IP address to check the blacklists. If you find that you are on a blacklist, you will need to follow up with the website that has added you to their blacklist. That information is provided by the tool above. 2) Make sure that you are not in violation of the CAN-SPAM Act of 2003. You can see the official website here https://en.wikipedia.org/wiki/CAN-SPAM_Act_of_2003. Verify your emails are following the rules as instructed and earn good grades. 3) Make sure that your email authentication is enabled. The email authentication is a verification method used to stop spam coming from your email address even if you are not sending any. If your emails are not authenticated properly spammers can easily spoof emails coming from your domain. This causes your domain to get blacklisted even though you are not sending emails. 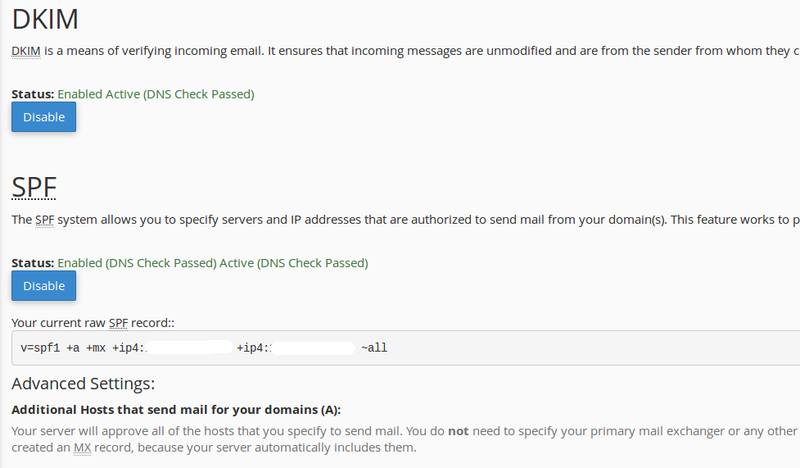 The email authentication can be enabled on your cPanel by following the below steps. Step 3: After you select Apache SpamAssassin >>You can enable DKIM and SPF by clicking on the enable button. Your emails will be authenticated after enabling both DKIM and SPF records. Step 4: The mail servers must use a reverse DNS (Domain Name System) setup and is also a good solution. PTR records are used for the reverse DNS lookup. If the PTR records are successfully set up, using the IP address you can get the associated domain/hostname. An A record should exist for every PTR record. If you are facing any issue or if you have any clarification, you can contact our support team via live chat, email, toll-free or ticket system and our support team are available 24/7 they will be happy to help you with your issue.